These are my favorite chocolate chip cookies. 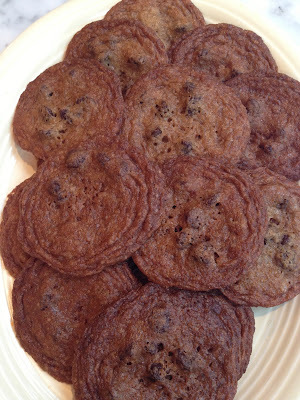 They really are not even chocolate chips like the Jacques Torres ones I introduced you to last year. These are chewy crispy melt in your mouth toffee heaven. They are not that easy to make, because you have to really space them out on silpats or parchment, and watch them like a hawk so that they do not overcook and burn, or undercook, in which case the middles sort of fall away. Beat the butter until creamy using an electric mixer, and gradually beat in sugars, and vanilla. When fluffy, beat in the egg. Add in salt and baking soda briefly, then add flour quickly, don't overbeat –Stir in the chocolate chips and stir until it is all just mixed. Chill the dough for at least an hour (or longer). Slightly roll heaping teaspoons of the dough between your hands, and place at least 2" apart on parchment-lined heavy cookie sheets. Bake one sheet at a time on center rack for 12 minutes or until edges are golden brown, and the centers no longer look white. If you love salted caramel, sprinkle the tops with some Maldon or other flaky sea salt.